This blog post will be further updated as new information becomes available during 2018. Weatherlink.com is the Internet cloud platform that Davis operates for viewing your weather data online in a web browser or via a mobile app. This blue‑sky presentation (right) is probably the most familiar data view of the existing platform. 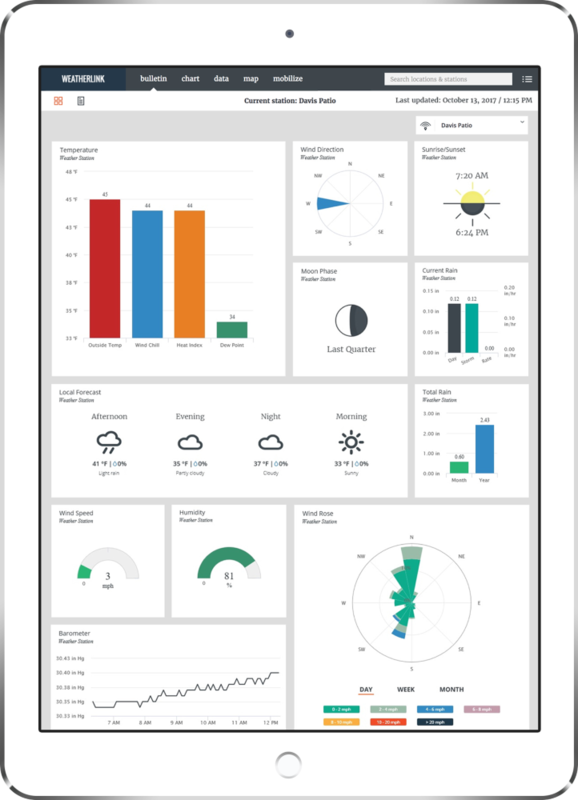 The data originates from any one of three Davis weather station configurations: a PC or Mac running the Weatherlink program; the WeatherlinkIP logger; or a remote Vantage Connect unit. At the last count there were over 26, 000 users worldwide actively uploading data to Weatherlink.com, including roughly 1000 UK contributors, making it one of the largest global weather networks. 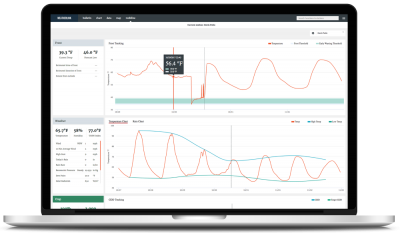 Earlier this year, Davis launched their new EnviroMonitor (EM) range providing for much more flexible remote monitoring of the environment, as outlined in a previous news post with more detail on our dedicated EnviroMonitor website. A key part of the EM system is an impressive new online platform for processing and viewing the EM data, including sophisticated smartphone apps. 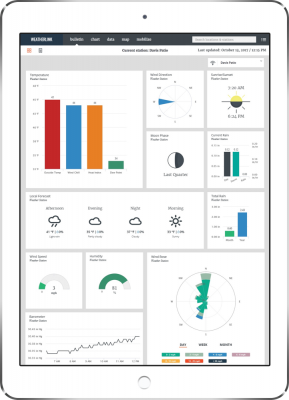 One example of the customisable dashboard on an iPad is shown below (click to enlarge). Put another way, weatherlink.com 2.0 is a major step towards moving the whole of the Weatherlink for Windows functionality online into a cloud application. There are still a few functions not included as yet, but should mostly appear in planned future updates. This new platform is now being rolled out to both new and existing users of weatherlink.com, as explained below. One caveat: we have answers to most questions, but a few details are not yet 100% clear – we’ll aim to clarify these as soon as possible. Existing and prospective customers are welcome to contact us with any questions. As from 28th November 2017, all new subscribers to weatherlink.com will automatically see and be registered to the 2.0 platform. Existing subscribers will be migrated across automatically, all to be completed by June 2018. Users will be advised by email as and when migration of their data has occurred. The new weatherlink.com 2.0 platform will be a two-tier system, with two levels of features: ‘Basic’ and ‘Pro’. Basic level corresponds essentially to the features that are available now with the existing weatherlink.com service, but in a considerably updated format. Pro level adds several sophisticated new features including online charting and data-browsing capabilities together with data-sharing; further Pro level features are in the development pipeline too. Weatherlink.com 2.0 is a platform with many features and with more to come; in this short blog article we can only highlight the main points. Just as a reminder to potential new users, the weatherlink.com features described here are all delivered via the Internet using a standard web browser or a smartphone app. The features are therefore available anywhere on any device that has Internet or WiFi or cellular access, as appropriate to the device. We understand that both are indeed on the roadmap for weatherlink.com 2.0 and likely to appear in a future version during 2018, probably at the Pro level. New or migrated users running a local copy of Weatherlink on PC or Mac, or using a WeatherlinkIP logger, will be able to access the Basic level by default. Upgrading to the subscription-based Pro level will be fully optional but newly registered users will receive a free 30-day trial of the Pro level (before reverting back to Basic if a subscription is not taken out). Users of Weatherlink for Windows/Mac and new WeatherlinkIP users should be able to register a Basic level account immediately and should also be able to trial the Pro level immediately and for the duration of the 30-day trial period. We would expect that by end-December (ie expiry of the Pro trial) the process to purchase the Pro upgrade option should be clarified. Connect users, who will already be using a subscription plan, will automatically receive the Pro level service – the Pro cost will effectively be included within the Connect data plan prices. New Connect users (post 28th Nov) should see the Pro service immediately. Existing Connect users will need to await migration. Existing Weatherlink subscribers who are migrated over to the new platform during 2018 will receive the Pro level service for a pro rata period depending on the expiry date of their existing subscription. At the end of the pro rata period, users can then decide whether to renew the Pro level subscription or fall back to the free Basic level. We still await full details of how this process will work.